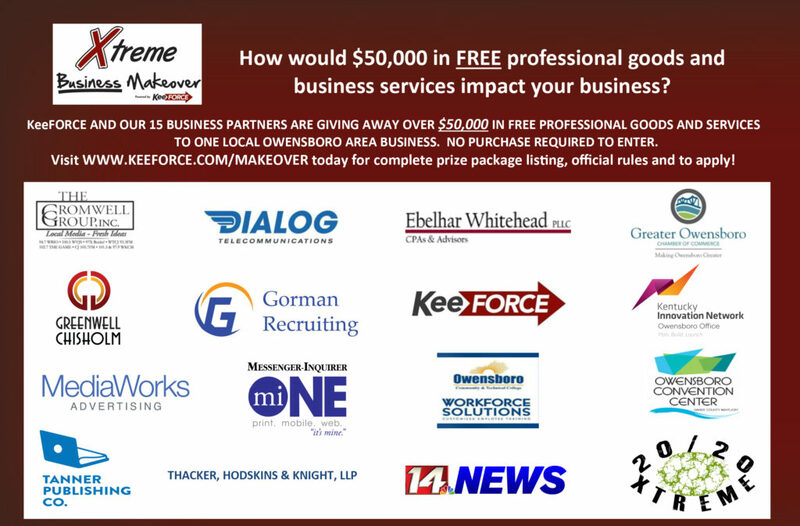 The Xtreme Business Makeover represents a partnership of 16 successful, regional companies dedicated to helping other businesses grow and prosper in the Owensboro area. The project aims to provide one lucky organization with a “business makeover package” to help the winner take their business operations from ordinary to extraordinary! One business in the Owensboro area will win a Grand Prize that includes free professional goods and services valued at over $50,000. The contest is designed to help the winning organization find “the next level of success” for their business. The contest is open to Daviess, McLean and Hancock County businesses with three or more employees who have operated for more than two years as of February 1, 2017. Non-profit organizations and home based businesses are not eligible. The winner will be selected by an independent panel of judges based on demonstrated need, community involvement, and dedication to growing their business in the Owensboro area. APPLY TODAY BY VISITING WWW.KEEFORCE.COM/MAKEOVER Applications due by March 17th.